Riggs made a mistake, and so he had to go. Removing him was the right decision; one that required courage on behalf of the staff, but sent the message that the paper’s ethics would always come first. 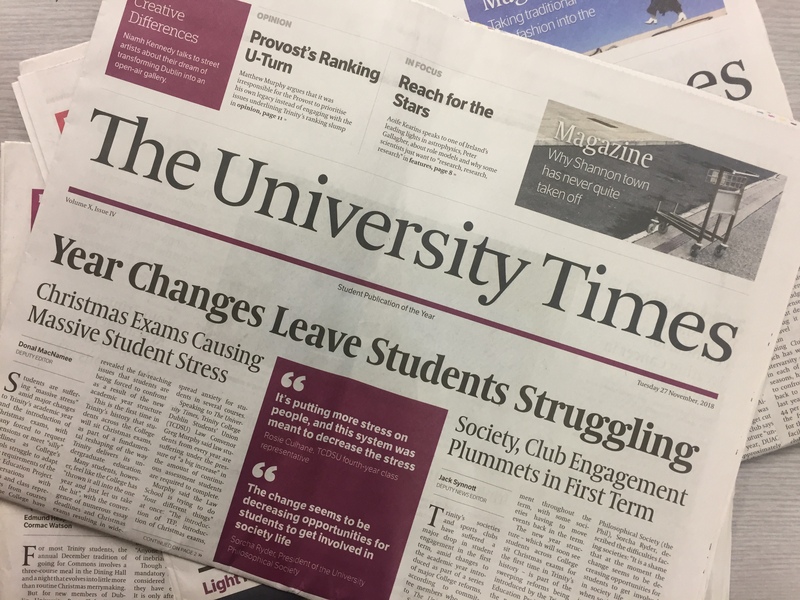 The staff and editor of the University Times need to show that same courage now. The paper admitted on Friday that on the night of February 27 reporters “placed a recording device outside” – bugged – the New Square apartment of Ben Arrowsmith, a student, to get a story. Instead of apologising for the bugging, the paper’s editorial team have tried to justify the privacy breach by focusing instead on the actions of the sports club, The Knights of the Campanile. But this discussion is not about The Knights of the Campanile. This is about the bugging of students by UT, which constitutes a gross breach of journalistic ethics and a threat to the safety and privacy of every student on campus. The only way to restore the credibility of UT and ensure this never happens again is for those responsible to resign. Although their intentions were undoubtedly good – a desire to reveal something about campus culture – UT have breached any code of journalistic ethics worth the name. In their ethical handbook, The New York Times, considered one of the most reputable news outlets in the world, states: “Staff members should disclose their identity to people they cover”; and later, “[staff] may not tap telephones, invade computer files or otherwise eavesdrop electronically on news sources”. If UT’s journalists had been working for The New York Times, they would have lost their jobs. UT have claimed that RTÉ and The Irish Times have used the same methods of source-gathering in the past, but this is not true. Those organisations have never bugged anyone’s home. Another crucial difference is that their biggest intrusions were overwhelmingly in the public interest – which is the test applied by courts when trying to establish whether this kind of reporting is legal – as when an RTÉ researcher posed as an employee of Áras Attracta to expose abuse against residents there. Whatever you think about The Knights of the Campanile’s “hazing”, it is in no way comparable to such abuses. UT’s behaviour is better compared to the News International phone-hacking scandal in the UK in 2011, in which News of the World bugged many high-profile people in British society, including Gordon Brown and the Royal Family. The scandal was so great that it led to the closure of News of the World. UT’s actions constitute a serious ethical breach of the highest order. However, what makes things worse is that they have completely failed to show remorse for them. Riggs understood, as Editor, that the buck stopped with him, but the current editorial team have disguised the gravity of their actions by hiding it within a news article. About half of the article is devoted to a defence of the paper’s actions rather than reportage of a story. The story is also about events from more than two weeks ago, which raises the question of why it was not published earlier. Earlier this week, Trinity News received numerous tips that UT had bugged a student’s apartment; we pursued the story and on Friday evening, when we were ready to publish, we approached UT for comment. They requested time to prepare a statement, and it was during that time that they published the Knights of the Campanile article. Why did UT wait for more than two weeks to publish an article about events that occurred on February 27, and then publish it on the evening when a story alleging that they breached journalistic ethics was about to break? There is journalism and there is spin. UT’s article was a panicked cover-up, an attempt to PR manage rather than break an ethical story. The most concerning thing about this behaviour is that it gives every indication that UT are willing to bug people again if they feel that they will get a story from it. We should all be worried about the prospect of being in a university where one of the newspapers bugs apartments and invades students’ privacy. If there is the possibility that the media are listening to everything we do and say, even in our own homes, then we simply do not have private lives. If UT escape this situation with no consequences, and believe, as both the current and incoming editors who wrote the story seem to, that secret recordings are acceptable news sources, then students should be worried. You might believe that you are safe, that nothing you do would be newsworthy, but imagine if you ran for a position on a society committee or as a part-time officer in the Students’ Union, and you made an exasperated remark in your kitchen about another candidate. Or if you were in a serious incident involving the Junior Dean, whether making a complaint or defending yourself against one, and the sensitive details of that were splashed across the front page with no consent from either yourself or the other party. This may sound like an exaggeration, but if you believe it is, then ask yourself this: where does UT draw the line? What would stop UT from placing recording devices outside the offices and rooms of every student of note? In this case, it appears that if UT, in their self-appointed role of moral arbiters of campus, decide you are a bad person, you deserve to be bugged. If the President of the Students’ Union admitted behind closed doors to lying about some central point of his manifesto, then that would surely be more in the public interest than the activities of The Knights of the Campanile on a Wednesday night. By UT’s own standards, this fact would justify bugging their home. This is the most concerning thing about UT’s conduct: without any guiding principle other than that the ends justify the means, no student is safe. It is for these reasons – the ethical violation and the cynical effort to mask that violation – that the editor’s position has become untenable. As long as they remain in their position and things are allowed to continue as normal, the paper will be tainted by this scandal. Its integrity has been destroyed. It can only be restored if those responsible apologise for their actions, step down, and allow the culture of the paper to change. The buck must always stop with the editor; UT insist that they have broken no laws – that is for a future court to decide – but they have violated journalistic ethics and convinced themselves that their actions were acceptable. If the point is not pressed home now, they will do it again. And that cannot be allowed to happen.